[Update:] I've added photos to show how to cut the eggplant. It's hard to take an appetizing picture of this eggplant (aubergine) dish. But I promise you that it's absolutely delicious. Plus, it's so simple to make, requiring just 6 ingredients and water. I found it in an old Japanese cooking magazine, which had an even worse photo of the dish than the one here. I was a bit sceptical but had bought a too-big batch of eggplant at the market, and wanted a way to use some of them up. I am so glad I tried the recipe, because it's now one of my favorite ways to have eggplant. And it's vegan too. There's a saying in Japanese, akinasu yome ni kuwasuna (秋なす　嫁に食わすな). It means "Don't let your daughter in law eat fall eggplants". People debate what the intent of this saying is; does it mean that fall eggplant are too delicious to feed to the daughter in law, who was traditionally the lowliest member of the family? Or perhaps it's a thought of kindness, since eggplant is supposed to be a 'cooling' vegetable, which is not good for a pregnant or fertile young woman. Either way, there's no doubt that eggplant is particularily delicious in late summer to early fall, when they usually produce a second crop after a first one early on. Cut the eggplants in half. 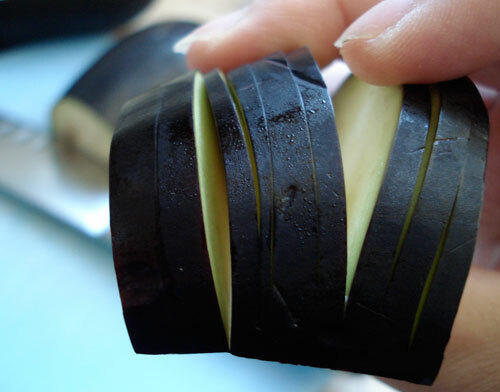 Make thin slit cuts in the skin side of the eggplants about 3/4 down, so that they stay attached at the bottom. (This makes the cooking liquid penetrate the eggplant evenly, and also looks much nicer than plain chunks.) If you are using big Western style eggplants, cut in half again lengthwise; if using Asian style thin ones, you don't have to do this. Cut into chunks crosswise. 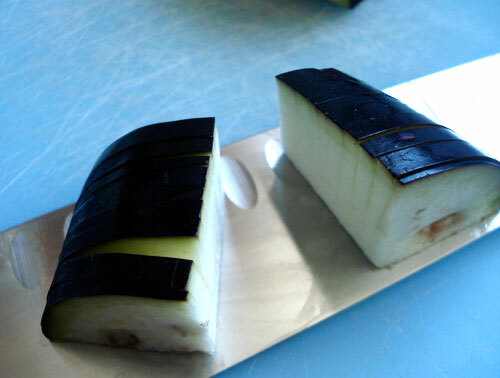 Here you see the slits are cut into a section of a large Western style eggplant. They are made from the skin side and go almost, but not quite, to the bottom. If you cut too far, not to worry - you are going to cut it up into chunks anyway. Once you've made your slit cuts all the way down the eggplant, cut into chunks (cutting down through one of the slit cuts you've made). Then, if you are using a fat eggplant, cut lengthwise so you end up with quarter-chunks like this. If you are using a slim Chinese or Japanese eggplant, you can leave them as half-chunks. Put the cut eggplant in a bowl of salt water (about the saltiness of water you'd cook pasta in). Put a bowl or plate on top as a weight to completely immerse the eggplant pieces, and leave for about 20 minutes. This gets rid of any bitterness in the eggplant, as well as making it easier to cook. In the meantime, de-seed and finely chop two small red Thai chili peppers. Drain the eggplant, and squeeze out the water. Heat up a pan with oil - you can use all sesame oil, all vegetable or olive oil, or a mixture. (Sesame oil will add a nutty flavor.) Sauté the eggplant slices until they are a little limp and coated with oil. Add the chili pepper near the end. Put into a heavy bottomed pan, and add enough water to cover. Add the soy sauce and sugar, and bring to a boil. Lower the heat to a simmer. Put an a pot lid that's smaller than the pot (that fits inside the pot) on top of the simmering eggplant, and let simmer for about 20-30 minutes until limp but not falling apart. Let cool in the cooking liquid - it absorbs more flavor as it rests. This keeps well for a few days in the fridge, well covered, immersed in the cooking liquid. It can be eaten hot or cold, though I think it tastes best when it is warm, eaten with a fresh bowl of rice. If you want to use it for bento, try draining off the liquid before packing. I've used a small lid that fits inside the pot right on top of the simmering food. This is called an otoshibuta. Traditional Japanese otoshibuta （落としぶた）are made of wood, and I've sometimes seen people on some forums insisting on the necessity of a wooden otoshibuta. To that I say, nuts. Otoshibuta literally means "dropped lid", and is put on top of cooking food so that the food cooks evenly. I usually just use a one-or-two-sizes smaller pot lid, but you can also use a heatproof plate completely wrapped in aluminum foil or kitchen paper, with a twisted 'handle' sticking up for easy of removal. For some delicate foods a simple layer of kitchen cooking paper or aluminum oil placed on top would be enough. Submitted by maki on 2008-09-05 18:43. It's not clear to me how one is supposed to cut the eggplants (Japanese ones). Is the first cut in half vertically or horizontal? Does one then slice or chunk the remainder? Thanks, I love trying your recipes. I've added photos to show how they are cut - hope that makes it clearer. I demo'ed on a Western style eggplant but you can extrapolate from that how to cut a Japanese eggplant. Mmm, I LOVE eggplant, and this looks really neat. I think I'll have to try it sometime! hi maki, i've read for a long time, but this is my first time commenting. i really love your site, because i am also japanese (1/2) and i live in munich, so your tips about cooking outside of japan are really perfect! I loooove aubergines, they are my favourite veg and I didn't know they were cooling either. I've read recently that aubergines (Western ones, anyway) have had the bitterness bred out of them, and so it is not necessary to soak in salted water. I'm a new visitor to your site -- I'm not a very good cook and I'm not Japanese, but my husband IS Japanese, we both love Japanese food (but live in the UK), and I'm trying to learn to cook more. I can't wait to try more of your recipes! Thank you for this site! In my home country, women looking to have children should not eat a lot of eggplants too. It is actually one of the old sayings that happen to have a scientific backing, that is, eggplant is a good source of estrogen, but if estrogen level is higher than progesterone in the body, women will not be able to get pregnant. Although I think you need to consume quite a lot to even worry about this. I have enjoyed reading your site, both when I lived in Japan and even now that I live in Israel. I have loved making curry "from scratch" from your site, which I would have never thought of doing when I lived in Japan. And today i loved the eggplant. I have no access to instant dashi, or chineese cabbage, or any kind of nori, or any fish product that doesn't have a tail. Although I can make my own dashi. I can get Miso and Shoyu. I came with a suitcase full of Japanese ingredients, but they were confiscated at the airport. Go figure---killer tofu? When I lived in Japan, through my sons school we made UDON "from scratch". Since all my UDON was confiscated, perhaps you have a receipt for making UDON noodles. I would like to give my family a christmas suprise and make UDON for Christmas. Or anything else that can be made with the very very basics. I was thinking about making Ozone for Oshogatsu, but I have no mochi. Is there a way to make mochi from regular middle-eastern rice? Hi Brandi. I applaud you for perservering with your Japanese cooking under difficult circumstances! I'm surprised there's no Japanese grocery store in Tel Aviv or somewhere. Anyway, I do have an udon recipe on the site - see here. You just have to make sure to use a very strong (high gluten) flour. I don't think you can make mochi from middle eastern rice...the rice has to be the sticky mochi rice. Thank you for posting this recipe! I love eggplant, but don't like all the prep that goes into most recipes, especially breading and frying. This one is so easy and delish! I did change a couple things; I didn't have a fresh chili pepper, but I did have some Chinese chili paste in the fridge and added a 1/2 teaspoon or so of that, worked great. Plus I added some thin sliced garlic and some freeze-dried fried tofu. Which tasted even better the next day after soaking in the eggplant juice all night. No one else in my family likes eggplant, so I get to eat this one all myself! Yum! Thank you for your egg plant recipe and added comments which is making the experience of preparing it more delicious and interesting! I've been in Japan twenty years and have missed the open interchange of recipes and food talk among strangers when shopping that I used to learn so much from in Spain. Anyway, after all this time, I've just discovered that blogging is a nice alternative. As for who and when aubergine shouldn't be eaten, I heard that in Bolivia, there's a saying that goes "Don't give aubergine to your daugher-in -law in Spring time!" ("No le des a tu nuera berengenas en primavera" ) which ties, since the seasons are the opposite from those in Japan and the UK. And about the bitterness, my aubergine is now soaking in salty water. Unlike the Japanese ones, aubergines used to be very bitter in Spain twenty years ago and my Spanish mother-in-law would slice them then sprinkle them liberally wilh salt and arrange them all around the inside of in a colander to sweat out their bitterness before rinsing them and frying them in a lot of olive oil. I don't think the Japanese aubergine needs to get rid of bitterness, but am soaking it as you recommend. I love this site. I just got back from a year in Japan and nearly despaired of being able to recreate anything I'd eaten while I was there when lo, into my empty arms came justhungry & justbentou. 嬉や嬉や〜 Thank you so much! Which I suppose only confirms that no one actually knows! Eggplant is so in season right now and so I had to make this again tonight! This is my all time favorite recipes of yours on this site! I've made this so many times now, and never get tired of it! I do also add a little chopped garlic like another reader suggested and it's yummy too. And lately I've been adding some fried tofu to make a complete meal. I love the sweet- spicy combo and eggplant is one of my favorite veggies. Unfortunately of the 4 people in my family only my older daughter and myself like eggplant, but that just means we get to eat it all ourselves, heh heh heh! I prepared them yesterday and they are looking pretty good..BUT, the taste is quite bland even though I followed all the points of the recipe..
Are they supposed to have a delicate taste? Do you eat them just like this or do you add some kind of flavour-sauce-dressing? thanks for sharing this. I will have to try as I love eggplants. Thanks for recipe! 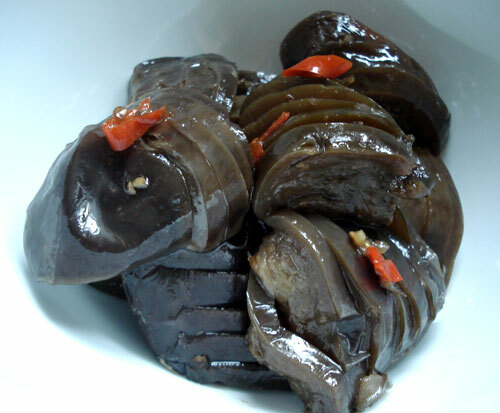 This remind me of the stewed eggplant that I have eaten in some of the Japanese restaurants here in Canada. Somehow, I thought they did not fry the eggplants. So, I wonder if this dish can be made without frying?